European Union flight ban against all Indonesian airlines no longer applies to seven national carriers. This is great news for international travelers wishing to dive in Gorontalo. Additionally, divers residing in Indonesia can have greater confidence to fly on certain airlines. Currently, airlines certified as meeting international safety and management standards are Garuda Indonesia, Airfast Indonesia, Ekspres Transportasi Antarbenua, Indonesia Air Asia, Citilink, Lion Air and Batik Air. The European Union website contains the official list. 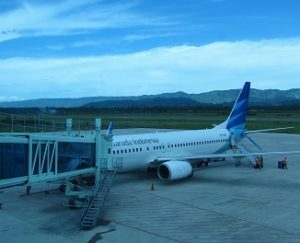 Garuda Indonesia, Citilink, Lion Air and Batik Air fly to Gorontalo’s Djalaluddin Airport (GTO). The ban also required travel agents in Europe to inform those traveling to Indonesia. Most noteworthy, the EU ban had an immediate, negative impact on the tourism sector in Indonesia. This included dive operators in Sulawesi. Two years later in July 2009 came the lifting of the European Union flight ban against Garuda Indonesia. Garuda Indonesia received its air safety certification from the International Air Travel Association the year before. Furthermore, IATA’s standards are very strict. A year later in 2010, Indonesia Air Asia gained EU permission to fly there. Actually, this airline had not yet begun operating at the time of the original European Union flight ban. In June 2016, the EU lifted its flight ban on three additional domestic carriers. Those were Citilink, Lion Air and Batik Air. In order to pass an IATA Operational Safety Audit, each airline must fulfill numerous technical and safety standards. The check list totals more than one thousand items. The audit itself takes about three months to complete with on-site inspectors. Issues include organizational and management systems, departure flights, aircraft and engine maintenance, cabin procedures, ground handling, cargo and operational safety. EU’s commissioner for transportation Violeta Bluc announced lifting the travel ban against Lion Air and Batik Air. She said, “We are pleased to improve the air safety level for EU citizens and the world. We are also pleased to expand flights worldwide.” As a result, those approved Indonesian airlines are looking at expanding internationally. Should you need flight information when coming to Gorontalo for your dive trip, please contact with us.